When Jared Turner, the co-founder of Mandarin Companion, sent an email to me, I’ve went to check his website right away. Why? Because, as you can read on the headline above, they offer an elegant solution to a difficult problem. No, I’m sorry to disappoint you but they don’t solve the pollution issue that is affecting China. What’s the biggest problem for people that start to study Chinese? What’s the biggest obstacle to become fluent (whatever “fluent” means to you)? You may differ with me, but in my opinion is the fact that everyday Chinese sources – newspapers, novels, movies, – are so difficult to understand and, after a few trials, you give up ’cause it’s just too boring. “What the hell, I watched this movie three times and I still can’t get who is the assassin,” is a common feeling among Mandarin’s students. When it comes down to movies, using English subtitles is a partial – and acceptable – solution. If this is what you’re looking for, then FluentU may be a good starting point. But if you want to read a novel then you have few options. Well, as far as I know until some months ago you had no decent options whatsoever (unless you’ve at least a HSK5 level). Why at least HSK5? Because I can write and know the meaning of almost all the characters of the HSK1-HSK4 lists and I’m still stuck. Give me a Chinese newspaper and I won’t get much out of it. And Mandarin Companion offers a solution to this problem. This is the reason for which, after almost a year, I took the time to write an article about Chinese language. How does Mandarin Companion work? The idea is quite simple. The books are classified by level of difficulty. All the books that belong to level 1 only contain 300 basic Chinese characters. This corresponds, more or less, to an HSK2 level that, I guess, anybody can reach in about six months of full-time study. Unless you’re studying on Sborto’s class, ça va sans dire. This is an awesome concept because it means that beginners Chinese students can now read (and understand) a short novel in Chinese language. Consider that, even if you could already find in the market books in Chinese that use a limited number of characters in order to ease the comprehension, as far as I know the choice was limited to books for children. Sherlock Holmes and the Red-Headed League, 卷发公司的案子. The Country of the Blind, 盲人国 (this one can’t be bought in Europe as there is still under copyright). All the books belong to the level 1 as, at the moment, it’s the only level that exists (keep in mind that we are talking about a company that started less than a year ago). Notice that these aren’t complete translations of the novels as it would be impossible to reach this goal with 300 characters. Instead, they represent a shortened adaptation. I tell you this because I’ve seen that, on Amazon, a reader let an harsh review of “The Secret Garden” because she believed she was buying the full translation of the book. The idea behind Mandarin Companion is totally different. If you can already understand a “real” novel in Chinese language so you don’t even need a translation, just buy a novel written by a Chinese author such a Yu Hua or whoever else you like. A last comment: sometimes, in order to respect the plot, the authors use words that are a bit more “complicated”. In this case they also add the English translation so you don’t need a dictionary. I’ve read “The Secret Garden” and I must say that the book fulfilled my expectations. I remember that when I moved to France in 2005 – and I could only speak Italian language,- I was desperate to learn French. Call it survival instinct. There was no internet on my dorm and, beside trying to talk with people (without much success, at least during the first weeks), my only option was to read books. So I headed to the FNAC, bought several French novels and started to read pretty much every time I was free. The first novel was painful. Even if I had studied French at school and Italian and French written languages are pretty similar, there were so many words I didn’t know. What I did was to look up the words on a French-Italian dictionary and write the translation directly on the book, close to the word I didn’t know. After 70-80 pages a miracle happened. I could understand almost every word. It was an awesome feeling. I couldn’t communicate yet with people but yeah, now I could read a whole novel. Or at least I thought I could. Because, when I started to read the second novel, something weird happened. In order to understand, I had to check all the time the dictionary again. But only for the first 70-80 pages. Then the “miracle” happened again. And I understood. Every writer uses a limited set of words over and over again. So, when you pick up a novel from a new author in a language you don’t master, you’ll encounter a lot of words that may be new to you. However, after you see them over and over again (70-80 pages seemed to be enough for my level of French on 2005), you’ll remember them and make them part of your everyday vocabulary. I believe this is the best way to become fluent in any language (as long as you keep using the words you learned so that you don’t forget them) and it’s the one I always recommend when people ask to me how to learn French, Spanish, Italian or some other “easy” language (easy for Western people, of course). The problem is that while with Latin languages you can deal fairly early with original sources because there are so many words we already know, with Chinese language this is impossible. And this is the void that, in my opinion, Mandarin Companion fulfills. Want to try a Mandarin Companion book? 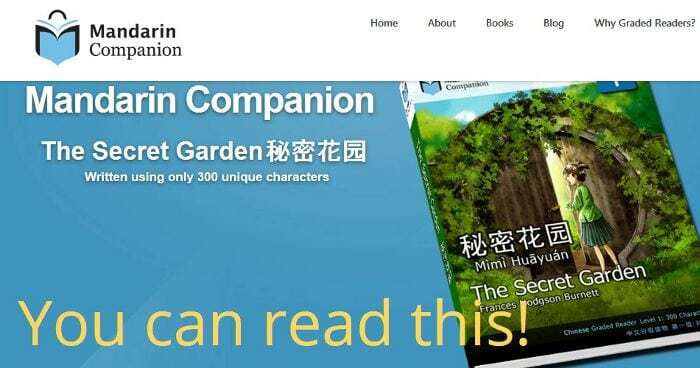 You can buy any Mandarin Companion’s e-Book on Amazon or iTunes for 9.99 USD. Have you ever tried to read a novel in Chinese? How did it go? How about the Chinese Breeze series? Also limited to a 300-word (character?) vocabulary. I read two printed books and liked them (and they come with fast and slow audio readings on an included mini-CD), and now they are available on Amazon as e-books as well. Not as ambitious as Mandarin Companion, but worth reading as well. Furio oh Furio, I am in Egypt now so it can be hard for me to get a book like this, is there Pinyin ? Thanks so much for sharing this wonderful resource! I’ve been looking for something exactly like this for so long! Unfortunately Chinese with Mike is now only available on Youtube. when it returns it will just as good but cost loads of money. Of course on YooTube it will be scattered all over the place. I wait to see the new site one day. if ever? Hi, I know Mike’s videos, they are good.